Ambassadors from France and Morocco along with Christiana Figueres spoke to the press on the final day of the Bonn UN Climate Change Conference, expressing their views on what parties accomplished in their two weeks in the German city, and their expectations for the upcoming talks in Morocco. 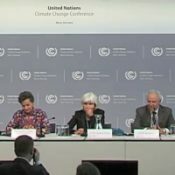 26 May 2016 | BONN | Germany | As Christiana Figueres makes clear during a press briefing helping to close out mid-year climate talks in Bonn, the emphasis of these meetings are now all about action and implementation. “I would say that these two weeks translate into a commitment of countries to do more, do more and then do more,” says Figueres, who is the Executive Secretary of the United Nations Framework Convention on Climate Change (UNFCCC). Along with Figueres, the press briefing included Laurence Tubiana, a Climate Ambassador from France, the country host of the 21st Conference of the Parties (COP 21) to the UNFCCC, which resulted in the Paris Agreement, an international pact to fight climate change and limit global warming to 2 degrees C, or, more preferably, 1.5 degrees C. It’s feasible that the Paris Agreement may enter into force as early as next year, sooner than initially thought, after 177 countries signed during an Earth Day event. Azziz Mekouar, Morocco’s Ambassador for Multilateral Negotiations, was also present at the conference, speaking about the country’s plans for COP 22, to take place in Marrakesh in November of this year. Morocco plans to raise the Lima-Paris Action Agenda, which is a platform to accelerate cooperative climate action beyond governments to cities, businesses and others, to a new height, Mekouar explains. “The action agenda is key because it’s the real world. It’s where people around the world can see that what we’re doing is meaningful,” he says. And Figueres agrees saying that more than ever before, now is time to put teeth into climate action agendas. “What is really at the core of all of this is making a difference on the ground,” she says. The Bonn talks were a nuts and bolts event as parties focused on initial steps to creating a rule book for speedy implementation of the Paris Agreement and how the pact will work once it has entered into force. It was also about figuring out ways to not only achieve the emissions reductions countries carefully committed to in Paris, but also to increase these ambitions in time. It’s about turning the plans and intentions on paper into reality, Figueres says. “How do you make them bankable? How do you actually implement the policies and measures so they begin to make a difference on the ground,” she asks. And, according to Tubiana, the negotiations went well. “A number of things have been worked out and some almost finished here in these two weeks,” she says. Briefly, she explains that delegates made progress on building the transparency mechanism and monitoring, reviewing and verifying (MRV) functions. The talks also produced guidelines for how countries will communicate their activities and that conversations about transparency in financial flows are moving forward. Tubiana and Figueres both highlight that decisions coming out of Bonn were grounded in science, which continues to build on the science-based foundation of the Paris Agreement. Tubiana notes, for instance, that the Subsidiary Body for Scientific and Technological Advice made progress on the Intergovernmental Panel on Climate Change’s contribution to global stocktake, measuring how far the world is from achieving global climate goals. Mekouar says the technical progress Bonn made will continue in and beyond Marrakesh. Tubiana also mentions talks surrounding land use, land use-change and forestry (LULUCF), an almost always complicated web of negotiations. She says this group is prepared to have a draft decision in Marrakesh on forest regeneration, key for storing big quantities of emissions. “We won’t have the capacity to absorb CO2 from the atmosphere if we don’t improve the state of our forests through restoration,” Tubiana says. Ultimately, though, Tubiana’s big takeaway from Bonn and what she sees as the issue to potentially dominate Marrakesh is integration. Determining how governments will merge these various climate agendas into national economic plans will be a big question of the conference, she says. “In Paris, we had many separate elements and now is the time to bring them together as one,” Tubiana says. For more information on the climate talks in Bonn and the ongoing United Nations climate negotiations as a whole, listen to the latest episode of the Bionic Planet, the podcast of the Anthropocene.